Nigel G. Mitchell - Author, Blogger, Geek: Sample Sunday: "Friendly Forest"
This week's excerpt is from my work-in-progress, Friendly Forest, book 3 of my TOONS series. Terrestria nodded to the small dragon standing next to her. "Bring me the sacred scrolls of the prophecy." The dragon flapped its tiny wings and fluttered up to the castle tower. It came back down carrying a thick leather-bound book. When the dragon set the book in front of Terrestria, she used her mouth to pry open the cover. Cardboard shapes unfolded from the inside of the book. A mountainside sprang up, along with a cardboard sun. Terrestria looked down at it with reverence. "This is our most ancient of texts, passed down for generations among our people, the Cuddlinomicron." Crafty frowned. "A pop-up book?" Princess Terrestria pulled on a tab. It made the sun slide back and forth. "The prophecy speaks of the three newcomers who will free Friendly Forest from evil. They will come from outside the forest, they will be strong and brave, and they will be very ugly." Bizzy grinned at Crafty. "Ugly, huh? Hate to see those--"
Terrestria turned the page. Three cardboard cutouts of three people popped up, all holding hands. They looked exactly like Bizzy Beaver, Crafty Wolf, and Lucky Elf. Crafty nodded. "Yeah, kinda saw that one coming." 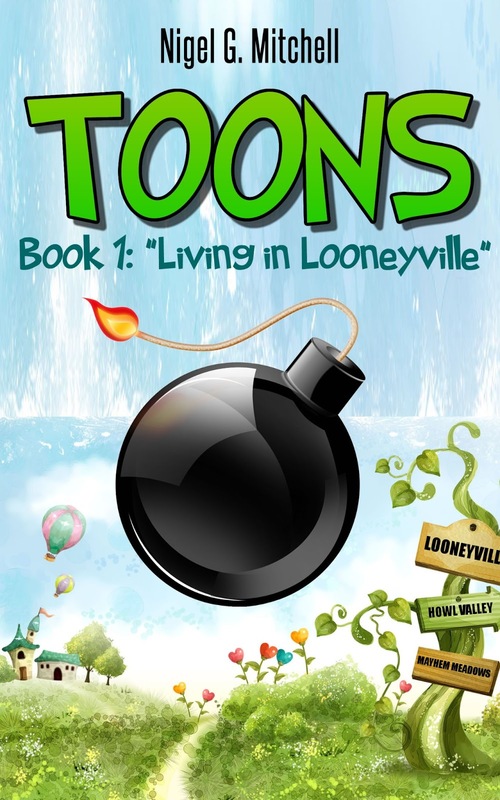 You can catch up with the first book, Living in Looneyville.